In macroeconomics, we study about two burning issues which is experienced by almost all the countries of the world, i.e. inflation and deflation. Inflation is a situation when the prices of goods and services get a boost, thus decreasing the buying power of money. It is the continuous upward movement in the general price level of the economy. On the other hand deflation, it is opposite of inflation, whereby prices of goods and services fall and people can purchase more goods with the limited money. It is the decrease in the general price level, in the country’s economy. A certain percentage of inflation is good, but beyond that, is worse for every economy. Moreover, deflation is the worst condition for an economy. 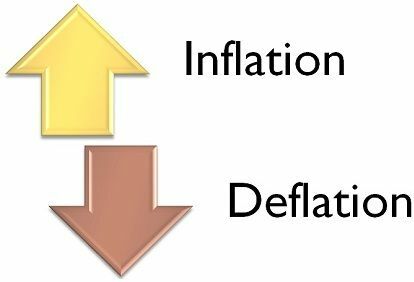 In this article excerpt, we have simplified the differences between inflation and deflation in tabular form. Meaning When the value of money decreases in the international market, then this situation is termed as inflation. Deflation is a situation, when the value of money increases in the international market. Classification Demand pull inflation, cost push inflation, stagflation and deflation. Debt deflation, money supply side deflation, credit deflation. Which is evil? A little bit of inflation is a symbol of economic growth of the country. Deflation is not good for an economy. A situation arises due to variability in the demand and supply of money, which causes an increase in the price of goods and services over time, is known as Inflation. When the value of money falls in the world economy, resulting in the rise of gold prices, it is termed as Inflation. Due to the presence of inflation in a country’s economy, the purchasing power of money contracts because of the upward shift of the general price level. Therefore, the common man will have to spend more money to acquire a few items. In India, measurement of inflation is done with the help of Wholesale Price Index (WPI) and Consumer Price Index (CPI). Inflation can be caused due to rise in public expenditure, tax evasion on a large scale, deficit financing, uneven agricultural growth, black marketing, hoarding, etc. Deflation is a situation, occurring due to the fall in the supply of money and credit, in the economy. This is also known by the name negative inflation because when the inflation rate is < 0%, deflation arises. The very reason for the occurrence of deflation is the fall in spending power at the micro and macro level as the price of the goods and services fall in the economy, so the customers wait for the further fall in their prices. In this way, the customers postpone their purchasing and consumption activity which hampers the whole economic cycle, due to which the investment remains idle. The outcome of deflation is the recession, fall in profits, depression and so on. When the value of money decreases in the world market, it is inflation, while if the value of money rises, then it is deflation. Inflation results in rising prices of goods and services, whereas prices of goods and services decrease in deflation. Inflation is helpful for producers or manufacturers. On the other hand, customers are benefited in deflation. There is a fall in national income in the situation of deflation, but this is not in the case of inflation. In inflation, the distribution of income is not even amidst rich and poor. Conversely, Deflation becomes a cause for a rise in the level of unemployment. A slight amount of inflation is good for the country’s economy. However, deflation creates hurdles in the path of economic growth of the country. There are some measures adopted by the government of a country to control inflation like monetary measures, fiscal measures, controlling the investment, etc. There are several steps taken by the Central Bank to eradicate deflation from the economy. So, we can say that a lower rate of inflation is good, but a situation like deflation is hard to tackle because it may lead the country to depression and therefore deflation is dreadful.